Semana Santa is an annual Catholic tradition commemorating the pains and sufferings of Jesus Christ to save the world from sins. It is also referred to as Cuaresma, Mahal na Araw or Holy Week and usually observed either in the month of March or April. This is considered as one of the most important religious festivals of the entire year. The Holy Week is started with Palm Sunday or Domingo Ramus where parishioners attend mass bringing their palm fronds composed of olive leaf, braided coconut leaves, San Francisco leaves, with aromatic anis stalk with its flowers and seeds for blessing. After mass, the people approached the altar with the priest blessing the palm leaves with holy water. It is people’s belief that palm leaves give protection and security to the home and family throughout the year. It can even ward off evil spirits and avert lightning if placed in windows or front doors. Good Friday is the time at which Jesus is traditionally believed to have died. 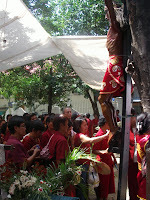 There was a solemn street procession of all the images and religious icons. They take them in floats to streets with candles. I remember last year, my mom hosted the Siete Palabras or the reading of the last seven words at home. 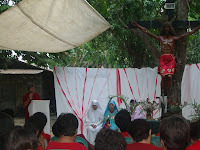 It was attended by members of the Nazareno association from the entire province of Pangasinan. I was invited by my former students Rheden and Ogilyn to become one of the godparents of their son Ian Gabriel on his baptism to the Christian world. It was officiated at the St. Wiliam Cathedral. It’s a double celebration of his baptism and first birthday. The reception was held at La Preciosa Restaurant. Padapadakam is a song rendered by the relatives, friends and guests to the birthday celebrator. It is a song to wish goodluck. They offer the celebrator with a halo of flowers and roses while singing the song, then each guest shall shower the celebrator with rose petals and rice to symbolize prosperity.